Sahra Su Holiday Village & Spa, Fathiye is a pretty resort in the Babadag mountain range. Surrounded by greenery and pine trees, the hotel stands amidst breathtaking scenery. 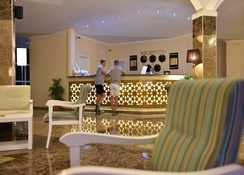 The hotel caters to – couples, families, groups and solo travelers. This hotel is also friendly towards people with mobility issues. 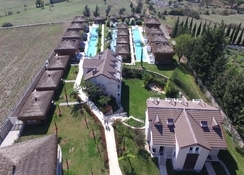 Located 60 km from the Dalaman Airport, Turkey, Sahra Su Holiday Village is located amidst pine forests and mountains. It is also in close proximity to Hisaronu (3 km) and Fathiye (8 km). The hotel is located on the beach and has its own private beach area. There are four types of rooms guests can choose at the hotel—standard room, attic room, family room and bungalow. These are equipped with air conditioning unit, electric kettle, flat screen TV with satellite, free WiFi internet, hairdryer, mini bar, safe box and shower or bath and telephone. Private swimming pools are available for guests staying at the bungalows. Room service is available round the clock. While the main buffet restaurant serves grilled seafood and other Turkish cuisine along with three main meals, the ala carte restaurant is for Mediterranean cuisine; and requires a day’s prior booking. The snack bar gets you non-alcoholic drinks and light snacks, soups etc till midnight. There are four bars, the Lobby Bar (24x7), The Pool Bar, Vitamin Bar and the Lounge Bar that serve an array of drinks. Sahra Su offers an array of fun and leisurely activities for guests. In the hotel, there are facilities for indoor and outdoor games such as billiards, canoeing, cycling, diving, darts, horse riding, snorkeling, tennis and table tennis. Other amenities offered are children's playground, entertainment staff, evening entertainment, fitness centre, karaoke, kids’ club, library massage, hammam, private beach area, spa and wellness centre and sauna. *This is strictly a non-smoking resort. From arriving at the holiday village the whole experience was fantastic. The staff were fabulous when they welcomed my partner and I to the hotel and took us up to our room and explained everything. The facilities were amazing, all the pools and the entertainment during the day was the best. All the staff from the waiters and waitresses, the entertainment team, the cleaners EVERYBODY were lovely and couldn’t of been more helpful if they tried. The food was very nice and the all inclusive was perfect. The hotel location was ideal, quick taxi ride to the Blue Lagoon and to the lovely picturesque bars and restaurants of Oludeniz! Would happily come back and stay again. Stayed 9-16th May. In a swim up room, which I would totally recommend! It’s a Lovely compact resort with lots of pools! Always plenty of choice at breakfast lunch & dinner! Entertainment held in reception every night outside of season, perfect with a few drinks 🤣. All in all a great stay. Must visit old deniz, shuttle from hotel takes you straight into the blue lagoon! Fethiye a must visit too! Beautiful setting, take me back!! This is the 2nd time I have used Teletext Holidays. I was helped to book the Sahra Su with your agent called Greig who was brilliant! The Sahra Su Holiday Village is a beautiful resort in a magical area of Turkey. Everything was as described and better and all the staff were fantastic. This region of Turkey has something for everyone within easy reach. I would highly recommend this resort and have every confidence in Teletext Holidays and Thomas Cook Airlines. Friendly staff, good food, clean pool, beautiful location in the mountain's, cheap taxis and great weather what more could you want. Great hotel, had an amazing time.